Independent Living Strategist and the nation’s leading authority on aging-in-place. Louis has years of experience helping individual families, builders/ developers and communities set the stage for folks to remain safe and comfortable in their own homes. Of course you need an entry that works to get in and out. But, like a cigar, the entry is never just an entry. You need to know that you can get in and out, that you are not a prisoner or shut in, that you don’t have to ask favors or hire people to get to and return from an appointment…or even more important…. an event you want to attend. The entry is both your practical and symbolic connection to the rest of the world. No step entries are recommended. I did not use the word ramp which has an unattractive, add-on, possibly jury-rigged and/or temporary appearance and connotation. I prefer no step entries that employ berms and paths – disappearing into the landscape. That is not so hard once you conceive of it AND learn the design criteria. No step entries (and ramps) should have a maximum slope of 1:12. That is one unit of rise per one unit of run. It doesn’t matter whether it is inches or feet, the slope should be no more than 1:12. Steeper slopes can be climbed by strong users or helpers and some electric chairs and scooters but going down a steeper slope is often pretty scary and some riders have pitched forward falling out. Turning platforms should by 5′ x 5′ or longer if the turn is 180 degrees. 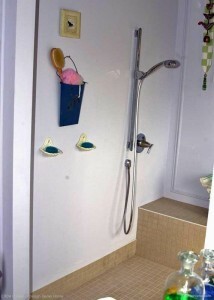 The top area must be wide enough to handle a doorswing AND the entrant. There should be 2′ clearance on the latch (non-hinge) side of the door. 5′ x 5′ might not be enough. 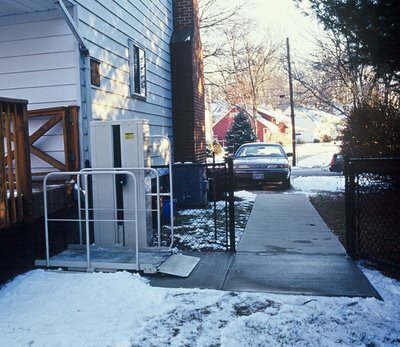 Sloped entryways should have grippable handrails if they are more than thirty inches off the ground, or if the user uses a rail to pull, stabilize or slow down. All sloped entries do not NEED rails. It is good to consider the conditions at unloading from a vehicle. I often suggest a ‘bell shaped’ widening so transfers can occur on pavement instead of in the mud. There should be room for the transferee, mobility aid like a wheelchair or walker and an assistant. Sometimes mechanical equipment is the best way to make a no step entry. The financial advantages become clear around 30″ of rise (30 feet of run). The equipment can blend into the landscape or be built into porch and rail. Often a strategically placed bush helps a lift to be almost unnoticeable. 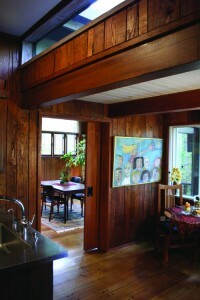 Critical: The top area must be level with the interior floor. You may laugh but I have many pictures of no step entries that get to the STOOP – 8″ from the goal. That last step is not just a doozy, it renders the whole effort a total failure. Many I have seen that fail this way are solidly built by skilled and well meaning folks. They just didn’t quite get it. The entry also includes getting the mail, getting in with packages and doing it all safely. A package shelf is helpful so things do not have to be set on the ground. Safety means not falling, but it also means feeling secure from the night and other fear inducing elements. 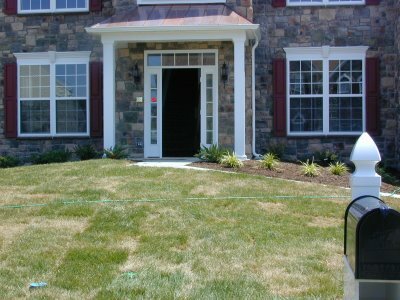 It is great if the entry is covered so weather is at bay when you look for your key and operate the door. A light…possibly motion detected- is a great idea. AND the house numbers should be large and mounted with contrast. Everyone is not best with a sloped entry. Folks with hip replacements, for example, sometimes find sloped walkways difficult. 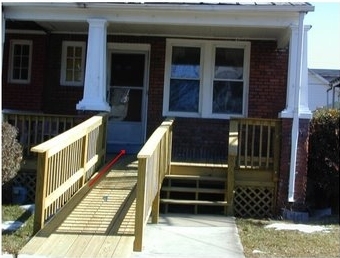 Porches and steps should be in good condition with handrails on both sides. An additional grip from the stoop to the interior may be needed. There are also ‘walker steps’ large enough for a walker or other device and the user to take steps slowly. These should rise three or four inches per tread and may be 18″ to 24″ deep. The entry is # 1 on most people’s agenda when they start to imagine getting in and out of their house. Almost everyone wants to Age in Place. Too many of us are forced to move, losing the comforts and familiarity of our home, because we cannot get in the door. It is also important that YOUR home welcome visitors. 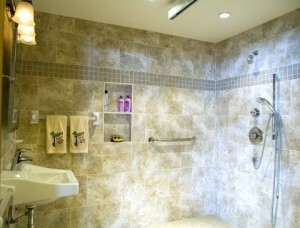 When you are waiting to get out of rehab from an injury or illness is not the time to make your home accessible. The time to do it is NOW! Next PostHow useful is a ‘PERS’ compared to a cell phone?